2.75" x 1.25" thermal transfer label on a 1" x 5" core. 1850 labels per roll / 4 rolls per case. Zebra 83260 special features - Non-perforated. Use with wax or wax/resin ribbon. 4.00" x 5.00" thermal transfer label on a 1" x 5" core. 570 labels per roll / 6 rolls per case. Zebra 10009531 special features - Perforated. Use with wax or wax/resin ribbon. 4.00" x 6.00" thermal transfer label on a 1" x 5" core. 470 labels per roll / 12 rolls per case. 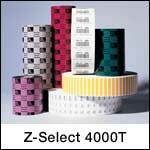 Zebra 800274-605 special features - Perforated. Use with wax or wax/resin ribbon.